Published: Feb. 27, 2010 at 06:13 p.m. 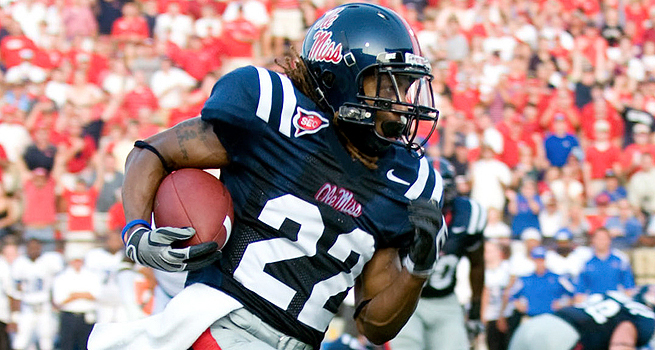 The open-field ability of Mississippi's Dexter McCluster makes him an enticing prospect at the pro level. INDIANAPOLIS -- Stanfordâs Toby Gerhart was one of the most productive running backs in college football last season (1,871 yards, 27 touchdowns) and was the Heisman Trophy runner-up; but heâs rarely mentioned as an elite pro prospect. Could he be another second- to mid-round steal, like a Shonn Greene or Jamaal Charles? That could depend on his 40-yard-dash time at the NFL Scouting Combine on Sunday. A sub-4.6 time and the powerful Gerhart, who bypassed his senior season, could pique the interest of the multitude of teams that need running backs and increase his draft stock. Anything slower and he could confirm suspicions and be viewed as a late-round, low-risk gamble. Clemsonâs C.J. Spiller, a breakaway threat in the mold of Tennesseeâs Chris Johnson, is the best running back in the draft. Fresno Stateâs Ryan Matthews, a prototypical tailback with good size, speed and pass-protection skills, could be the next running back off the board. Blount is a gamble. No sugar coating it. What was worse than him sneaking a punch to the face of a helmetless Boise State player early last season was the escalation of his temper in the following moments. That Sprewellian moment will scare teams off, as will other off-field concerns. He also missed most of the season because of discipline handed down from the incident, so there isnât much fresh tape of him. He is still an NFL talent with a huge body and quick feet. If he can redeem his character in any way, he could be a sleeper pickup for a team in need of an old-school power back. The diminutive speedster is an open-field threat who can play tough when he needs to. McCluster can be used in a variety of ways, including as a returner, which makes him valuable. A blistering 40 at the combine will generate enough attention to possibly make him an early-round sleeper. The NFL game is played in space and McCluster in the open field is an advantage a lot of teams would love. Gerhart can run, jump and compete with any of his counterparts. There are teams looking for between-the-tackles running backs and Gerhart, whoâs constantly outworked people to get where he is, could be an answer. Another big back who could help himself by running a good 40 time and showing solid change of direction in the variety of drills. Some teams donât know what to make of the highly productive player because he gained a ton of yards in a Wing-T, option system. Dwyer has played in a pro set before from a two-point stance but his heaviest production was as an option fullback. His powerful style seems like a solid fit for San Diego or (surprise) the Vikings if they lose Chester Taylor in free agency. Backing up a physical Adrian Peterson with the physical Dwyer could be scary. You canât coach speed and Best can flat out giddy-up. Injuries, especially a concussion that kept him out of action for a few games last season, are red flags that could scare some teams off. Best has Felix Jones-type qualities and if heâs used that way and stays healthy, he could be equally as explosive.